If you build it, they will drink | Do the twisted. Admit it. You judge a bottle of wine by its label. I do. But don’t we all? “I don’t know if the wine is good. I haven’t tasted it. The label looks cool though, so it must be good.” Yep, that about sums up the mental process while scouring the wine aisle. 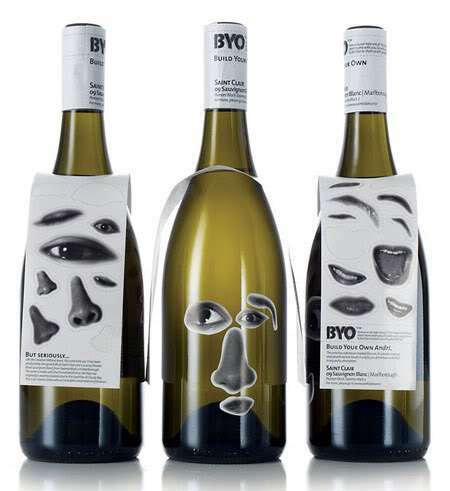 Now if bottles of wine had faces, then they’d be much more trustworthy. You can always trust a face, especially if you can build it to have that “I’m funny and I taste good” look. The Creative Method designed these fabulously funky wine labels so you can BYO – Build Your Own. You can still act all sophisticated. Just let your wine bottle make the funny faces. Not only would it make a great gift, but it’d make a great friend. You could totally have that Wilson thing going on from Castaway. Tough day. Lonely, quiet night. After 3 glasses, you’d find yourself being Chatty Cathy and gossiping with your wine bottle. Don’t act like you haven’t done it before. Now it’s just more humanized. *Sadly, these bottles are not available for purchase. They were created specifically as gifts for The Creative Method’s clients. One can only hope they acquire a winery as a client soon so we can begin consuming their wine and making funny faces other than our own. That is all to true, Many a time have I been in the supermarket trying to choose one bottle out of a hundred and always go for the wine bottle sporting the best picture or design on the label. A lot of people say most wine tastes the same as any other wine which may be the case but at least I have the bland wine with the cool label !